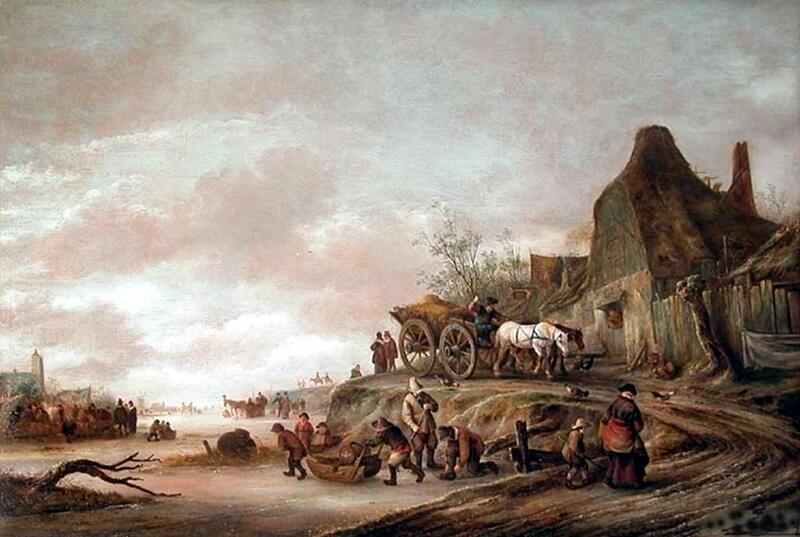 On 6th January 1709, the Feast of Epiphany, Europe woke up to one of the most severe winters on record. The temperature plummeted on the night of the 5th-6th January and kept on falling. Although thermometers were in their infancy, the readings broadly tally. In England William Derham, Rector of Upminster and member of the Royal Society, had been checking his thermometer and barometer three times a day since 1697. On 10th January he logged -12°C the lowest he had ever recorded. In France Philippe de la Hire had set up a thermometer at the Royal Observatory in Paris which employed a scale similar to that of Fahrenheit:: he recorded 48° on the 4th January, 30° on the 6th, then 22° on the 7th, 9° on the 10th and 5° on the 13th. Temperatures then remained at this level for ten days without respite (Monahan, Year of sorrows p.72). According to reconstructions based on the records of Louis Morin, the minimum temperature dropped to below -15°C on the 10th January and stayed there for eleven successive days. On three days (13th,14th and 19th January) readings fell to below -18°C. Lows were recorded of -25°C in Paris, -17°C in Montpellier and -20,5°C in Bordeaux. From all over France came reports of people found frozen to death, of limbs and fingers lost to frostbite, of commerce and industry entirely halted. According to Saint-Simon, within four days, the Seine and other rivers were frozen solid. Something no-one had before seen, the sea froze solid enough to bear heavy carts; even in Marseille ice was to be seen in the salty Mediterranean. Agriculture suffered paralysis. In Beaune a canon of the cathedral remarked that "travellers died in the countryside, livestock in the stables, wild animals in the woods. 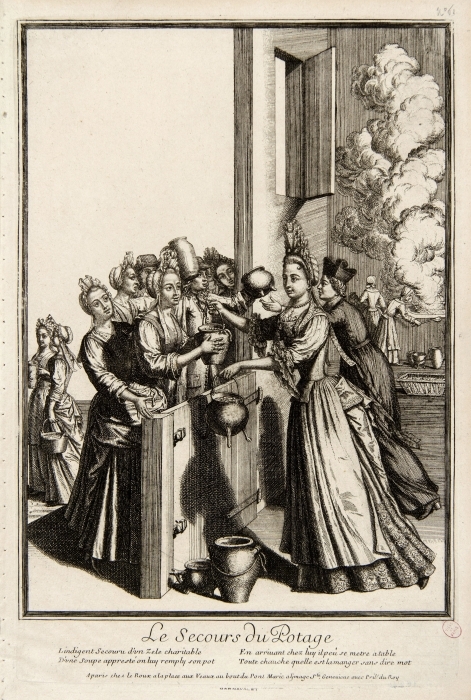 Nearly all the birds were killed, wine froze in barrels, and public fires were lit to warm the poor"(Quoted Monahan, p.73) In Paris itself ateliers and shops closed and public life ground to a halt as trials and audiences were suspended. Public fires were lit in Les Halles and soup kitchens organised. Throughout France, congregations united in prayers that the winter would not last. On the night of the 24th January, temperatures suddenly rose and the icy winds vanished to be replaced by rain. In many places the thaw proved almost as devastating as the frost. Near Lyon, for instance, the Soane flooded the low-lying valley around Vaie, marooning blocks of ice "the size of two men". Whole trees were washed down and abandoned on the banks and walls built alongside the water were smashed to pieces. Lyon's three bridges were damaged and tethered boats were were smashed or carried downstream. The respite was only temporarily as fresh waves of cold soon followed throughout February and March. Modern climatologists identify six further waves of sub-zero temperatures which kept the country in the grip of frost until mid-March. 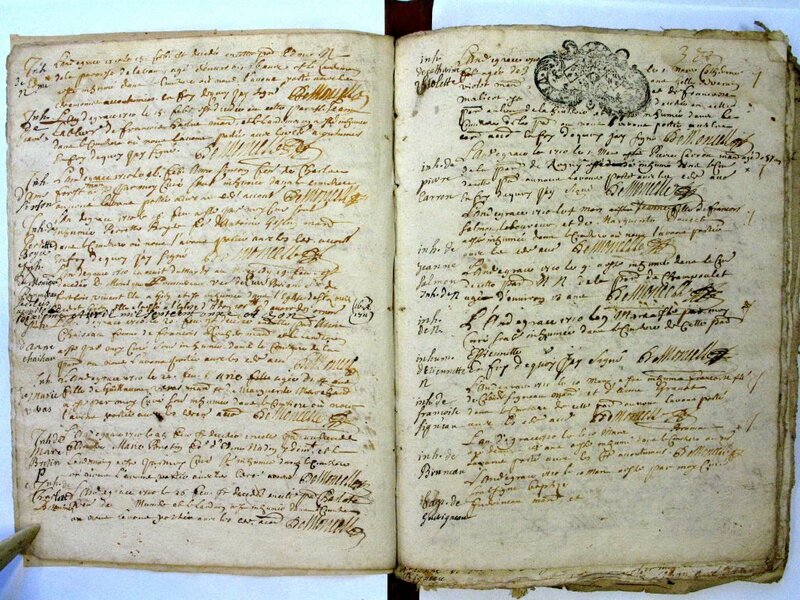 In February he princess Palatine's letters record reports of people dying of cold, corpses found frozen in fields and travellers devoured by wolves. The earth was now froze solid, in places to the depth of a metre or more. The thaw and refreezing completed the destruction of vegetation, which was frozen without a protective layer of snow. Fruit trees and olive trees all perished; vines withered and many growers were forced off the land. Walnuts and chestnut trees, even firs were destroyed. Great oak trees were reported to have split suddenly with a noise like musket fire. Beans, which were a staple in many areas, were spoilt. Domestic animals lay dead in herds, their carcasses rotting in the fields. Game animals perished, even hares and rabbits. At the edges of the sea, now frozen for several kilometres, the fish lay dead. All of which paled into insignificance compared with the loss of cereal crops. According to Emmanuel Le Roy Ladurie, the miseries of 1709 had been set in train in 1708 when late frosts and prolonged rain had made for a mediocre harvest. In the countryside the cereals crops - wheat, rye, winter oats - were now lost. The ground was drenched, then frozen hard, leaving the seedlings dead where they lay. Only maize and barley sown in the spring escaped. In March letters from the provincial intendants began to reach Versailles from with news of increasing panic at the delay of the winter wheat crop. Peasants reacted rapidly by replacing the spoilt crop with spring barley. Despite the warnings, the government hoped for a long time that the wheat would survive and sent out instructions to prevent the reseeding of fields already planted with wheat or rye. Distribution of bread at the Tuileries in 1709. In urban areas transport paralysis and dearth of supplies meant a crisis for consumers. The capital received no supplies at all between January and April and the price of a setier of wheat rose six fold between June 1708 and June 1709. Preoccupied by the dislocation of the War of Spanish Succession royal government was slow to acknowledge the extent of the crisis. Desmarets failed to act on advice that grain should be imported into the country. Only at end of April was a commission set up under the direction of Henri François d’Aguesseau (1668-1751) Procurator-General of the Parlement, to co-ordinate the relief effort. Royal policy was directed mainly at freeing up supplies and preventing speculation. On 27th April a royal arrêt required all stocks of wheat to be declared on pain of fine, even of condemnation to the galleys. The lieutenant général de police d'Argenson placed the markets of Paris under surveillance, raids were conducted on storehouses and the purchase of bread was strictly limited by person and time. Intendants were sent the provinces to enforce similar policies. The duc de Saint-Simon affirms that the manège des blés was roughly handled and that many took advantage to profit from the afflictions of the poor. In his diagnosis, secret royal stockpiling exacerbated the situation. It combined with draconian controls on movement of grain to bring widespread financial ruin and to induce famine conditions . Enforced taxation, ostensibly for road repairs and poor relief, swelled the iroyal coffers (Memoirs, vol. 6 chpt 54) Meanwhile in May the Court, led by Louis XIV, ostentatiously surrendered its plate to the treasury and on 12th June a royal discourse was read from all the pulpits of France asking for the war effort to be renewed. The population reacted in the time honoured way with direct action. In the countryside bands attacked chateaux and convents which were suspected of having grain reserves. Troops were sent into the provinces for fear of peasant unrest: the tally is 155 uprisings from February to June 1709 and 38 during the summer. After April there were food riots in Paris, Normandy, Provence, Languedoc, Dauphiné and Val de Loire. The Dauphin was accosted by a crowd of women demanding bread,and the marquis d'Argenson had the windows of his carriage broken. Saint-Simon noted the disquiet of Louis XIV faced with a "flood of placards" which were posted on the gates of Paris, the churches, public places and above all on royal statues. 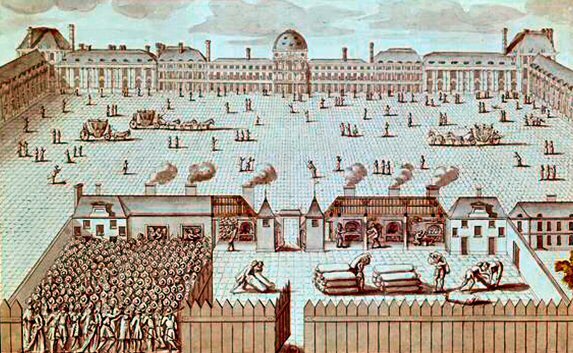 As late as 20th August 1709 several people were killed in an incident at an "atelier public"which was giving out bread in exchange for labour levelling an area of raised ground between Porte Saint-Denis and Porte Saint-Martin; vast numbers assembled for the bread distribution, bakers's shops were pillaged and the gardes-françaises fired on the crowd. Following this episode policing of the capital was increased further, the situation eased and the streets remained quiet. Official records and Court memoirs can only give a limited sense of the scale of the hardship endured by the ordinary people. It is now clear that 1709 represented the last great subsistence crisis of the Ancien Régime. Social historians reckon that the population of France, on the upturn since 1700, decreased in 1709-10 by perhaps 800,000 (600,000 direct extra deaths, with another 200,000 accounted for by a decline in the birthrate). Behind those figures, lie countless stories of malnutrition, disease and lost livelihoods. Reports circulated of desperate people eating grass like animals, an image which would endure permanently to tarnish the declining years of the Sun King in men's minds. There are now numerous local history websites, each with its piece of testimony. The cumulative effect of local studies based on parish records, household accounts, local diarists, begins to reveal full extent of the misery. "Le grand hiver de 1709", Histoire pour tous, post of 6.2.12. 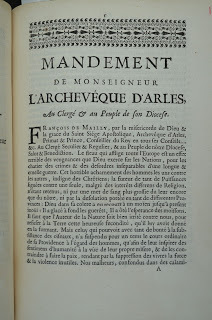 Wikipedia article: "Grande famine de 1709"
Pastoral letter of 2 June 1709, François de Mailly, Archbishop of Arles, requests prayers for the time of famine, which he attributes to God's displeasure ("l'Auteur de la Nature soit bien irrité contre nous..." ) a formulaic statement perhaps from a man who could not have mentioned the truth, that the endless wars of Louis XIV made everything so much worse. But the writer's main object here is to propose, together with prayer, practical relief efforts for the poor – the sale of church silver to buy them bread. 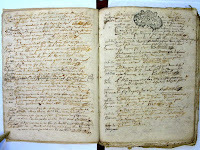 Parish register from Adon in the department of the Loiret; in the course of the two years 1709-10, this little village of 400 souls lost 35 per cent of its population. "Le Grand hiver 1709" Geneawiki. Thank you for providing interesting and valuable information which was referenced during a discussion of sun spot cycles and temperatures.